"Once you get to earth orbit, you’re halfway to anywhere in the solar system," Robert Heinlein is oft-quoted as saying. The Space Access Conference focuses on how to make this a routinely affordable reality. 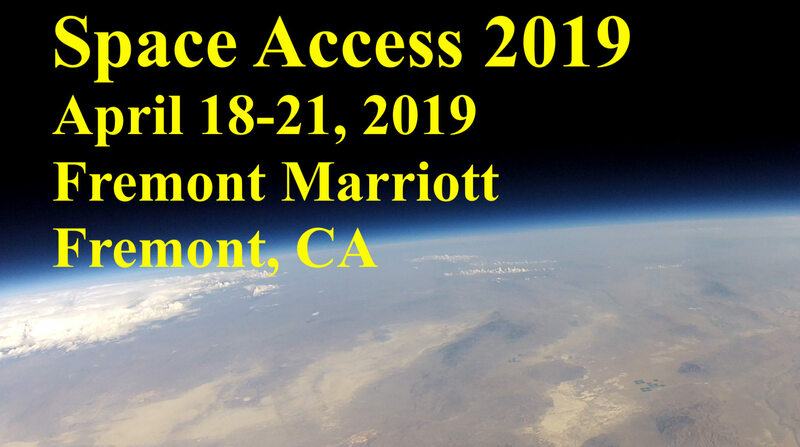 Following a 3-year hiatus, Space Access 2019 comes to Silicon Valley from its historic home in Phoenix, AZ, where it met from 1994 to 2016. It has been described as "Hackers" for rocket people, with three days of total immersion in making the future happen. It is known for its single-track intense programming with industry leaders from 9am to 10:30pm, but with enough breaks for camaraderie among rocket builders. The emerging themes this year are: Current Rocket Startups, Cislunar Reusable-Vehicle/Propellant-Depot Transport Networks, and Advanced High-Energy Space Propulsion. In prior years, the conference was run by the Space Access Society. This year, it is run in cooperation with Silicon Valley's Experimental Rocket Propulsion Society, including support from several members of the AIAA San Francisco Section. Pre-registration rates (until March 26): regular attendees $180, students $60. There are also affordable rates for exhibitors and patrons. A special room rate is available at the Marriott. AIAA San Francisco will be present in the exhibit area. Come by and say hello.